Being healthy doesn’t have to cost a lot of money. Small changes to your routine can lead to big changes in your health. Tweaking your lifestyle in a few simple ways can improve the way you feel and the way you see your body. It seems like everyone’s joined a gym in the last few years. But being healthy doesn’t need to involve making major changes that you might not be able to keep up; the best approach is to improve the daily habits you already have. It starts the moment you get out of bed. You might not be ready to become a full-on yoga master, but a brief stretch before you go to work will do your body and mind a world of good. Stretching in the morning improves your blood supply from head to toe, delivering nutrients around your body. And it strengthens your muscles, which will make the rest of your new routine seem much easier. At lunch, the change is simple: take your time! Experts have shown that paying attention to what you eat at lunch will make you feel less like snacking in the afternoon. If you work while you’re eating, or gobble your sandwich down in a hurry, you will literally ‘forget’ you ate it — at least on a subconscious level. You don’t need to extend your lunch break, as long as you are mindful towards what you’re eating. And the final cheap, healthy thing to do before bed? Switch off your devices! Scrolling through the news or social media when you’re about to catch some z’s makes your mind more active just when you need to nod off. You need at least seven hours of quality sleep. This is when your body repairs its cells and tissues, and your hormones go to work fighting off infection and rebuilding your immune system. Everything you do — big or small — has an impact on your health. To help you get started, we’ve created an infographic with 50 simple and inexpensive health improvement tips. There’s something new to try for every part of the day. Good health is a privilege, but it’s one you can earn without investing time and money that you don’t have. Make a few positive tweaks in how you treat your body, and you should find yourself healthier, happier, and full of energy. This article was republished with permission via NetCredit. 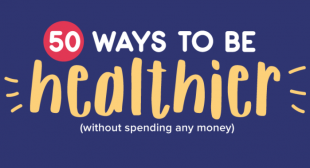 The post 50 Ways to Be Healthier (Without Spending Any Money) appeared first on FinerMinds.